Right about this time last year I began making bunnies. When my daughter saw them, she said they looked like "Disapproving Rabbits" (if you haven't seen them online, check them out), and she laughed and laughed. During the winter I was gifted with some angora bunny fur. I carded some of it up with some dyed wool and spun it into some really soft yarn. 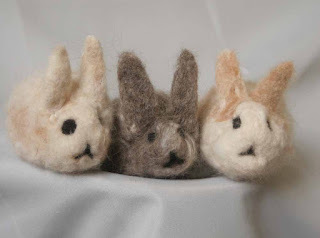 These bunnies are the result of another project with the angora. I carded it with natural color fiber and needle felted tiny bunnies. Each one fits just in the palm of your hand. I love having them around!